Melodyne is a programme that allows a completely new approach to the handling of audio material. It analyzes the pitch and time of monophonic audio files (from, for example, singers, wind or string instruments) and offers the opportunity to change whole melodies in a way only previously possible at MIDI-Level. 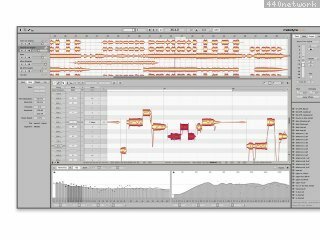 Melodyne is able to change the musical parameters of voices or instruments without any actual influence on the character of the recording. Melodyne extracts the pitch and the rhythm, and provides an area in which to play with the audio material. Any change in this material is interpreted by the software in a musically intelligent manner and the result will always sound natural. Working with Melodyne is as easy as editing notes with MIDI. Melodyne 2.0 offers a wide range of integration options and adds many new features. The new version introduces the "MelodyneBridge", a new technology which allows Melodyne to be connected to any VST or AudioUnit host. Though Melodyne remains a stand alone application, it can now be used as if it was an effect plug in - comfortable and without adding any latencies. The MelodyneBridge offers maximum flexibility and allows Melodyne to fit into conventional recording workflows. In addition, Melodyne 2.0 implements the ReWire protocol and can be connected and synced to all ReWire applications, like Cubase, DigitalPerformer, Live, Logic, ProTools or Reason. It can also be synced to MidiClock and SMPTE, and supports MIDI In and Out as well. Users can control Melodyne via MIDI keyboards and remote controllers (MackieControl, LogicControl, Radical SAC and others) and can send the musical content of audio file as MIDI to synthesizers in realtime. This includes velocity and pitch phrasings, which makes it one of the most impressive audio to MIDI converters available. Futhermore Melodyne's mixing features have been improved by adding equalizers, insert effects, aux sends and returns, group tracks and - as the first multitrack recording application ever - access to both VST and AudioUnit effect plug-ins (like Waves, Prosoniq, PSP, TCWorks and others). Whilst Melodyne always was running on ASIO, DirectX, SoundManager and CoreAudio based hardware, the Studio Edition of the new version adds DirectIO support to enable the use of Digidesign hardware directly. Version 4.1.1 comes with a new Separate Note command and some bug fixes. This constitutes the most extensive update to the entire product family in the company’s history, with the emphasis on Melodyne 4 studio. Highlights include the Sound Editor with its totally new sound design possibilities, DNA Direct Note Access – at last, on an unlimited number of tracks – and ultra-accurate tempo detection. The smaller Melodyne editions – editor, assistant and essential – have also been enhanced. This service update improve the general stability of the program and contain numerous enhanced details. Among other things, a ReWire problem was fixed that could lead to unexpected behaviour. Support for the current Pro Tools version 7.4. Transferring audio via the MelodyneBridge could in some cases damage previously edited files that have been exported using the Save audio command before. Exporting split stereo files could keep the MelodyneBridge from doing further transfers. Removing a previously inserted MelodyneBridge (AU version only) from a track in Ableton Live could crash Live. Detection can now be switched between MS-Mode (default) and 'normal' stereo (to be set as an option under Preferences). This option allows better handling of files that have no mid/side components, eg. play-along files, where left and right side are completely independent. MS-Mode (the one, that was the only mode before) leads to crosstalk in such cases, but gives you better results in time-stretching of 'normal' files. If using Melodyne with iLok, there's no need to type in the serial number any more. MelodyneBridge supports offline-rendering now (as it's done by certain hosts). RAM usage of MSL (Melodyne Sound Library) files has been improved, working with these files is much smoother now. In some circumstances batch-detecting many files (100+) could lead to a crash. [Win XP] During batch-detection switching to the desktop could make Melodyne stop the detection or even freeze. "Revert and reset position" could lead to a crash (very short files only). Sometimes double-click with the modulation tool could lead to a crash. Added tracks now adapt to the name of the audio files dragged to them. [OS X] Some window constellations (i. e. certain error messages popping up) could lock each other and the program had to be killed. The presets of the built-in Podolski synth are installed properly again. When running the Waves Transform Bundle, Melodyne could crash. The EQ setting is now displayed correctly on the screen when controlled via MIDI remote. After removing and reconnecting the MIDI interface, it is still recognized now. Monitoring sound files from the Melody Manager can now be done using any output of the audio interface (was output 1/2 only before). Importing certain polyphonic audio files could lead to a crash. [Win] Loading certain WAV files could lead to a crash. Loading certain longer AIF files could lead to a crash. Exporting audio now saves all selected tracks no matter if the editor window is still up in front. Names may now contain slashes "/" and colons ":" (this could lead to crashes before). Saving could lead to a crash when files were overwritten. Running as a ReWire client under Logic Pro, Melodyne could crash when notes were deleted. When running with Sonar 5, creating multiple harmonies could make Melodyne crash. When running in MTC sync, Melodyne could crash. You don't have to type in your serial number any more after you've changed the license method going back from iLok to challenge/response again. Melodyne 3.1 runs as 'Universal Binary' now also native on Intel Macs, if desired stand-alone or connected via ReWire, VST, AU or RTAS with a host. The new version inaugurates the Melodyne Sound Library. The very high-quality sounds are derived from Ueberschall's Liquid Instruments, and were specially conceived, recorded and prepared for flexible use with Melodyne technology. In version 3.1, Melodyne studio and cre8 can use the iLok dongle as an option for authorisation, making the flexible use of Melodyne on different computers and in different studios possible, even if you own one Melodyne license only. If you do not wish to use the iLok dongle, you can still authorize your Melodyne 3.1 with the existing procedure of challenge and response. Among other new features are the simple management of used audio files, a switchable pitch grid, extended combi tools, a common reset function for all pitch editing, new keyboard commands, a percentage entry for time stretching and a tempo tapping function. In addition, the polyphonic algorithm of the studio version has again been considerably improved. Melodyne 3.1 also exports tracks notewise now if desired. Where possible, the MIDI Root Key is written automatically into the files created – which is ideal as it allows you to use these quickly in the sampler and without the additional trouble of mapping. In addition, the new version now also reads automatically the tempo information contained in many files (e.g. Apple Loops and Acid files). For version 3.1, all known bugs have been fixed and ReWire stability further improved. Whether the material contains block chords (homophony) or parts that are melodically and rhythmically independent (polyphony), Melodyne3 is able to apply pitch shifting, time stretching and quantization to it in real time — and the sound quality is all you would expect from Melodyne. This uniquely flexible way of handling audio material will lead to a whole new style of working in the studio: with Melodyne3, the note-based rearrangement and remixing of songs are child's play, offering producers new creative options when dealing with harmonic tracks. MelodyneBridge: The AU version of the MelodyneBridge has been modified for greater compatibility with Logic Pro 7 and DigitalPerformer 4.5. 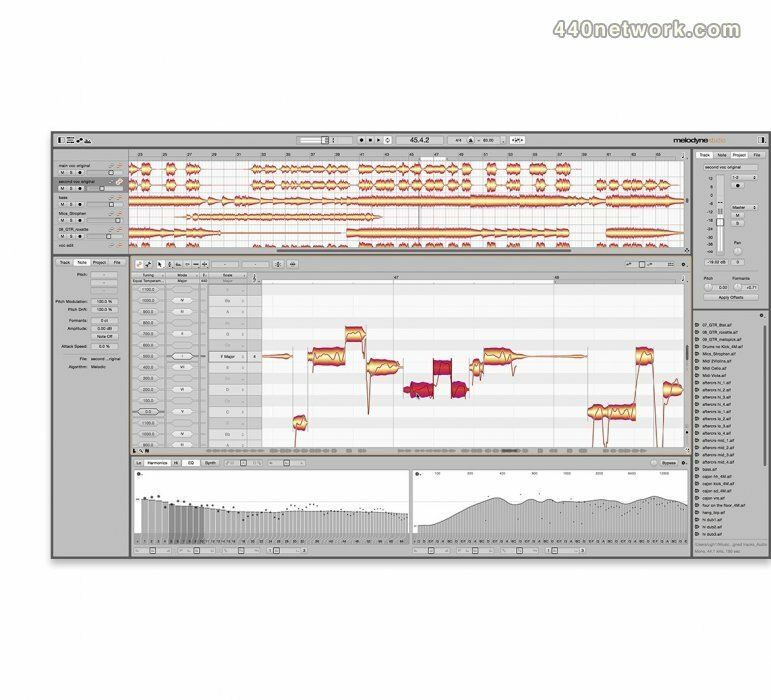 MelodyneBridge: When Melodyne is connected through the MelodyneBridge, a newly created arrangement has only four tracks instead of the usual eight. This is because only a few tracks are generally required in this situation. The mixer allows to add instruments tracks which can run AU and VSTi plug ins and which can be chosen as a target in Melodyne's MIDI send inspector. RTAS Version of the MelodyneBridge added. AU version of the MelodyneBridge enhanced, especially for compatibility with Logic 6.4.2 and DigitalPerformer 4.12. The MelodyneBridge does now show up if it currently synchronizing the host's and Melodyne's transports and if the bridge is overloaded. Effect and Instrument PlugIn compatibility was enhanced. Opening existing arrangements is up to 4 times faster on MacOS X. Exporting audio files is up to 5 times faster on all platforms. Melodyne's math routines were heavily optimized for G5 Processors. Specially SSE and Altivec are completely widely now. E.g. detecting melodies became twice as fast on some processor sets. Sound Files panel performance enhanced (especially for multi selection). Headroom for new arrangment settings available (See Preferences->Others->Default Gain). This does not apply if running as a MelodyneBridge client. 32 Bit Recording enabled for WAVE, AIFF and SND. New keyboard short cuts added to address available tool by index. Melodyne allows to load multiple tutorials (being in the "Tutorials" folder right next to the Melodyne application itself.). Mixer shows main volume in db now. Mixer's "Rec Monitor" setting is stored in the user's preferences. The definition editor routs it's audio to the same output channel than the main mixer now. "Save" and "Save As" do not clear the undo stack anymore. Forbidden plugins and non-compatible plugins are being registered as such on startup now. Dual head display configurations are supported. ASIO compatibility increased. (eg RME and Soundscape Cards are fully supported now). When running in ReWire slave mode "Master" can be switched on in Melodyne's transport panel to sync Melodyne's transport with te ReWire master application's. The mouse's scroll wheel works appropriate. Close arrangement using 'command-shift-w' asks for unsaved documents now. The UI for the build in reverb is working again. Menus were completely overworked: Submenus are displayed on the left side of thier parent if needed and they are also working well on MacOS dual screen configurations now. Exporting from the start of a reference track until the end of the last note in the arrangement resulted in export until the right locator. This is fixed. Smooth/Page scrolling are working appropriate now. Rubberband selection display glitches fixed. Transfering stereo tracks via the MelodyneBridge into Melodyne created mono files in some cases. This is fixed. A couple of minor fixes and improvements. Support for Mac OS 10.3 (Panther), running on a G5 now, and effect plugins are organized hierarchically now.